Amending my diss. manuscript after the (?) proofreading done by an English-speaking colleague of mine, it's funny to see what being a speaker of a language that does not have articles (the, a) does to one's English. The large majority of the (?) corrections concern the article the. Such a lousy language, in need of all that small loose stuff when everything could be expressed with single words, even if longer because of inflection and all that. B. Signification. I. Referring to an individual object (or objects). * Marking an object as before mentioned or already known, or contextually particularized (e.g. ‘We keep a dog. We are all fond of the dog’). 2. Used before a word denoting time, as the time, day, hour, moment: the time (etc.) in question, or under consideration; the time (now or then) present. the while: see WHILE. 5. Formerly with names of branches of learning, arts, crafts, games, and pursuits. Now chiefly dial. Also generally with gerundial vbl. ns. (arch.). And it's not just once that I've written "his husband" and "her wife"; yet another annoying trait of English to distinguish between "he" and "she". I have a hunch that these mistakes are familiar to ESL teachers in Korea. And yet another individual peculiarity, almost all of my also words were in a wrong place in sentences. Amnesty International has released a report on migrant workers in South Korea which, as is easy to guess since this is a human rights organization, is not pretty reading. Choi Jang-jip, a leading intellectual and critical thinker (not afraid to say so) in today's Korea, has written for Pressian a review of "Political Sociology of the Labor Market in Contemporary Korea" (현대 노동시장의 정치사회학) by Jung E-hwan (?, Chông I-hwan) of Seoul National University of Technology. 최근 출간된 서울산업대학교 정이환 교수의 은 앞에서 말한 이러한 학문적 상황에서 나타난 중요한 저작이라 할 수 있다. 무엇보다 이 책은 최근에 양산되는 정책보고서적 연구의 결과물도 아니고, 현장으로부터 괴리된 순수 학문적 연구도 아니며, 어떤 이데올로기적 편향이나 선진적 거시모델에 무비판적으로 경도된 연구도 아니다. 정 교수는 신자유주의적 세계화에 따른 산업 및 고용구조의 급격한 변화, 그리고 금융위기 이래 급속히 진행된 한국 노동시장의 분절화, 고용과 실업문제, 사회양극화의 문제를 중심으로 광범위하게 문헌을 섭렵하고 외국과 한국의 경험적 자료를 치밀하게 분석한다. 그리고 그 분석의 결과를 토대로 한국의 현실에서 실현가능한 하나의 대안적 노동시장 체제를 조심스럽게 제시한다. Hankyoreh 21 weekly has a story about the not so small problems that the Democratic Labor Party is struggling with at the moment. Nothing is really new: support figures going down like cow's tail (this isn't an English idiom, is it? ), power struggle between PD ("people's democracy") and NL ("national liberation") factions, an image too closely associated with the Korean Confederation of Trade Unions (KCTU), and North Korea as well. The article remarks that DLP has two "sacred precints" (sôngyôk 聖域), topics on which the range of opinions is very restricted: KCTU and North Korea. The former is given treatment in the text, citing opinion surveys on DLP, but the latter, North Korea, is given just that one notice - in a magazine that claims to have no "sacred precints" (성역없는 비판 보도 ). DLP has been doing some good work on the behalf of the self-employed for example in gathering info and providing support on the issue of high-interest loans, but as much as it aims and claims to work for and represent the interests of these shopkeepers and other petty businesspeople (most often sômin/seomin in the political lingo), it hasn't really been able to reach out to those people, and I guess one reason must be the KTCU image. It is interesting that the support of DLP is the highest among the "blue collars" (manufacturing industry workers, working class), and the income stratum with the highest support figure for DLP is 3-4 million won (2500-3300€). a moment via the game broadcast. The name of the ad is Pugûi chinsil, "Reality of the North": it shows first general images of what is, I guess, Pyongyang, then youngsters doing gymnastics or rehearshing for a mass show in front of a huge concrete building. Then it continues to the front of a dreary-looking grey apartment building, where a young boy rushes in, we learn, to watch the game between South Korea and Italy. 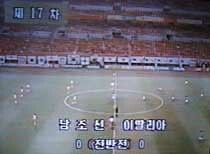 The North Korean announcer's voice is in the background. The family, a very extended one, or several neighbors, are sitting around the table and cheering for the goal that the South makes. I remember reading somewhere that the ad was shot with Chinese-Korean actors. With ads, it'd be too easy to make an issue of it being called Pugûi chinsil, "Reality of the North". 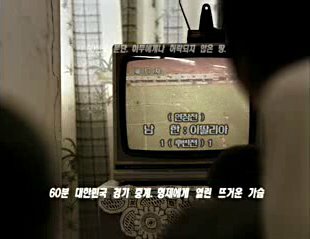 But I can't help making one: as much as the makers have created a DPRK-looking imagery (or what looks like the potential wievers' perception of the reality of the North), including also the lettering in the TV screen and the translitteration of "Italy" in North Korean style (이딸리아)- but not the name of the Republic of Korea. The picture above is a capture from the ad: South Korea is given as Namhan, which is a South Korean word for "South Korea", when the distinction with the North needs to be made or when Taehan Min'guk would be clumsy. In the North they'd never use it in such a context. But using the correct North Korean term for "South Korea", Namchosôn, as in the second capture of what should be the actual North Korean broadcast (snipped from this Weekly Donga article), would have taken the becoming one (hana toegi) a bit too far, considering that the viewers were most likely to include only the Republic of Korea in their idea of the team they were cheering, and also that there are things about South-North relations and issues which are not done just like that, such as having the name of the country as Namchosôn. One Finno-Korean factoid is that the head of the parliamentarian friendship group of the Republic of Korea (or whatever those country friendship groups that members of parliaments have are called) is Kari Uotila of Left Alliance. What is perhaps a little bit of interest is that his party comrades have for the most part felt (and many must still be feeling) affiliation with the northern part of the Korean peninsula than with the southern. Left Alliance is a party born out of the bankrupted (financially and ideologically) Communist Party of Finland and the Finnish People's Democratic League, which was a cover organization for both communists and left-wing socialists who felt too lefty to be Social Democrats. As far as I'm aware, MP Uotila was one of those left-wing socialists. What is also interesting, for his position as the head of the parliamentary South Korea friendship group, is that he is a shipyard worker by profession; perhaps much more than his politics, this fact would discourage him to feel affinity with South Korea, considering the frictions between EU and Korea over shipbuilding. But apparently either his politics or occupation do not matter for him, and that's all good. There's still room further away in the left to support DPRK. Oh well, South Korean rulers are all bunch of commies nowadays anyway, so it's only appropriate that a socialist parlamentarian wants to be their friend. 올해는 흉년(凶年)이다. 비가 안 와서 숲속 자연산 열매가 잘 안 나와서 그렇다. 제일 큰 걱정은 우크라이나와 러시아에서 건너온 그 나라 사정에 비해서 큰 돈을 벌기 위해서 열심히 열매를 따려는 사람들이다. 숲에 열매가 없어서 집에 가지고 갈 돈커녕 핀란드체류 생활비조차 벌기 힘등 상황이다. 우리야 열매를 겨울 내내 죽에 넣어 먹을 사람들이라 생사가 걸린 일은 아니지만 그동안 버릇이 된 데에 뭔가 대책을 세원야 한다. 자연산 열매 (블루베리, 링건베리) 대신 재배된 것을 보관해서 먹는 것이 그것이다. 재배된 열매의 수확이 보통이라 해서 가격도 자연산 열매의 금값도 아니다. 블랙커런트 5길로 5유로 할인된 12유로로 구할 수 있었다. 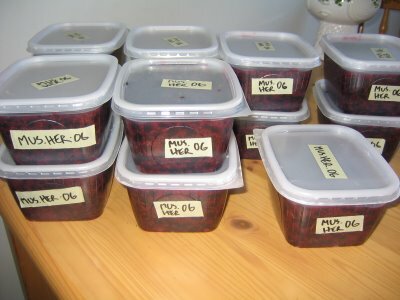 아래에서 부수어 설탕을 넣고 블래스틱통에서 냉동할 블랙커런트다. 맛은 독하고 쓰지만 설탕과 먹을 만하고 바이타민량은 으뜸이다. (통에 적은 것은 블랙커런트의 핀란드말의 줄임말이다.) 참, 열매가 정말 한국이름이 없는가 보다. 동물들은 한국이름이 알아듣고 기억하기 잘 지어져 있는데 (처음에 들어도 나무늘보가 무슨 놈인지 알 수 있음) 열매의 경우에는 엉뚱한 영어낱말만 쓰인다. 국립국어연구원이나 관련 단체에서 누가 이름 좀 지어 보게. I just received the sad news from the University of Washington that James Palais passed away today. It's a great loss to our field. I'm sure in a day or two somehow will send out an email obituary with details of his scholarly accomplishments.In the meantime, let me just say that it is not only his scholarship that will be missed. Those of us who were lucky enough to get to know Jim and work with him knew what a wonderful sense of humor he had. He also was a dedicated teacher of graduate students, determined to push his students to do the best they were capable of but doing so with a smile rather than a verbal whip. All of us who worked under him can say we have not only lost a mentor, we have also lost a friend. 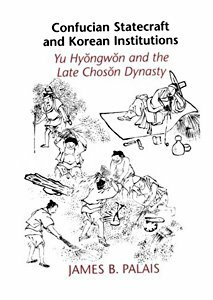 I have nothing else to add or to commemorate a great scholar but only say that if someone's going to read just one book on Chosôn dynasty Korea and is not afraid of more than 1000 pages and immense amount of info and analysis of premodern Korea, it'd be Confucian Statecraft and Korean Institutions: Yu Hyongwon and the Late Choson Dynasty by Palais. Owen has written a note on professor Palais' death at Frog in a Well, compiling also a bibliography of his most important works and articles. "I submitted professor Palais a 100-page manuscript, and after a few months I got it back from him with a 90-page commentary attached", says professor Park Cheong-sin. 동유럽 국가에서는 이러한 자유가 소련보다 더 컸다. 1950년대 말 이후 대부분의 동유럽 국가들은 주민들이 공산당 정권에 직접 도전하지 않으면 주민들의 개인생활에 별로 신경을 쓰지 않았다. 이러한 '관대한 입장'을 잘 표현해주는 말이 “우리를 반대하지 않는 사람이면 우리와 동맹자다”는 것이다. 이렇게 주장한 사람이 다름 아닌 수십 년 동안 헝가리 공산당 총비서로 지낸 야노시 카달이었다. 어떤 동유럽사람들이 핀란드사람들이 있는 자리에서 조금 비판적인 어조로 말해도 되는 줄 알았는데, 운이 안 좋았을 경우엔 말은 우리나라 공산주의자의 귀에 거슬렀다. 제일 악명 높은 경우는 핀란드 작가가 헝가리 작가를 고발한 사건이다. 핀란드 방문 허가를 받은 헝가리 작가가 핀란드 작가들하고 얘기를 나누는 자리에서 파시즘에 대해서 누군가 말을 거냈나. 헝가리 작가는 "검은 파시즘 아니면 빨간 파시즘 말씀이십니까"라는 식으로 물어보길레 그 말을 듣는 어느 핀란드작가 헝가리아 작가연맹에 고발편지를 보냈다. 깜빵에 들어가지는 않았지만 헝가리 당국들의 심한 검문을 당했다고 한다. 또 다른 사건이라 할 수 있을지 모를 일이 에스토니아에서 있었었다. 최근에 나온 에스토니아의 소련강점기 일상생활을 그리는 책에 따르면 어느 에스토니아 관광가이드가 핀란드사람들을 안내하고 있었는데, 그들은 다람쥐를 보고 나니 에스토니아 다람쥐가 털이 핀란드 다람쥐보다 얇다는 얘기가 나왔다. 에스토니아 가이드는 "우리 다람쥐가 사회주의 체제에서 자라서 그랬을 것"이라고 농담 좀 하길레 그 말을 들은 핀란드 방문객이 그 가이드를 소련체제를 비하했다고 소련당국들한테 고발했다. 그 때 그 사람들은 이랬었다.